The First Book of Hazel: A Quick Guide to the Hazel Internet Merchandising System in a three-ring binder with front, back and spine inserts. Printed with the main text in black-and-white, with code examples, images and diagrams in color. FoxAcre Press is proud to present the first detailed guide to the Internet's best webstore software. With over two hundred fifty pages of text covering Hazel Tags, Hazel Tokens, Hazel Actions, Loops, the Product and Options Files, plus a detailed discussion of all of Hazel's rule files, The First Book of Hazel has it all! Includes tables, diagrams and illustrations of Hazel's basic functions, plus a full index and table of contents, and pages of highly detailed coding examples. 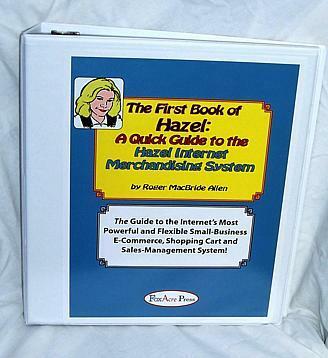 Hazel is The Best Small Business E-Commerce System on the Internet, and at last she gets the manual she deserves! The Hazel Internet Merchandising System is a powerful and flexible tool that lets you set up your e-commerce webstore your way, without having to put up with cookie-cutter presets, someone else's ideas of what the defaults should be, and limited options. Do you want to keep your site simple? Or do you want to take it to the next level of sophistication? With Hazel, you get to choose. If you can write basic HTML code, you can create an e-commerce website with Hazel. Use the full range of HTML commands, frames, Java, pop-up windows, and just about every other tool for websites to design your store without the limitations imposed by the pre-built systems offered by many services. Does your store have special requirements that just don't fit the standard off-the-shelf e-commerce models? No problem! Get total flexibility on payment management, sales tax, shipping charges, discounts, surcharges, coupons, and so much more. Do you want to do precisely targeted promotions? No problem. With Hazel, you can give everyone named Irving 10% off on all your blue-colored products on Tuesdays before 3pm. Maybe you don't need that much control, but you can get it by writing just a few lines of code for Hazel. Hazel let's you do it all! On a tight budget? For under $200, and with an evening's work, you can be up and running with a fully functional 100-item webstore. Upgrade to an unlimted-item webstore when you're ready. Add only the options and features you need, or upgrade directly to the most advanced version of Hazel. Get The First Book of Hazel and learn how to use this terrific program to create your own webstore -- and do so much more! A sampler of the text of The First Book of Hazel in a Three-Ring Binder can be viewed by clicking on this link. You may order the print edition of The First Book of Hazel in a Three-Ring Binder from FoxAcre Press, or from most major online booksellers. The links below will take you directly to the order links for this title.